The magazine will continue to be offered in print and digital formats, and Linux New Media’s international structure provides better service to subscribers worldwide, with local offices in North America and Europe and ordering options in various local currencies. Drupal Watchdog is written for the Drupal community and will only thrive through community participation. 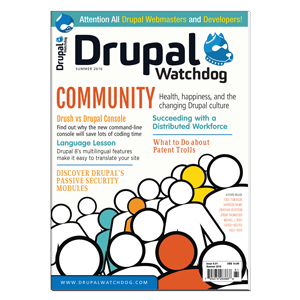 The first issue of Drupal Watchdog published by Linux New Media will be available May 9th! All DrupalCon attendees will receive a copy at the event. Come meet the new team, and learn more about the future of Drupal Watchdog!